Adding compost to your garden, especially when you have made it with manure, straw, kitchen or yard wastes, should create a rich soil environment for your plants to flourish. 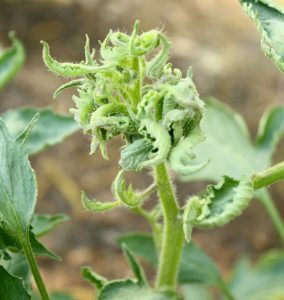 Generally this is true for purchased and homemade composts, but if your tomato leaves are curled oddly, and your pole beans aren’t climbing, it may be that trace amounts of herbicide are present in the compost. What are these herbicides and where did they originate? It’s important to know not all herbicides are the same – some kill grasses, others kill broadleaved weeds, and others burn down anything they touch. Homeowners are allowed to purchase and apply certain herbicides while only those with a license are allowed to apply others. But the herbicides of most concern to composters are specific ones licensed in North Carolina for broadleaf weed control in pastures and commercial turf (golf courses and business landscapes). These are herbicides in the pyridine carboxylic acids class, which includes aminopyralid, clopyralid, and picloram. There are lots of different product names, but these are the active ingredients listed on the label, so read the fine print. These herbicides are highly effective for broadleaf weed control, but the problem is they break down very slowly in the environment. So if you purchase straw that had these herbicides applied to the pasture or bring in manure from horses that ate that straw, you may have minute but toxic levels of the herbicide in your homemade compost. Grass clippings are another possible source as is any purchased compost. Even after high temperature composting, which normally takes care of undesirable weed seeds, pathogens, and many pesticides, these chemicals are still intact and can cause vegetable plant damage at parts per billion. So should you stop adding compost or organic materials to your garden? Absolutely not. Good quality composts, mulches and other organic matter are essential for optimal garden health. It is important however, to ask questions about how the materials—straw, manure and compost—were produced and by whom. Often, there will be little information about this history, but asking can’t hurt. The symptoms of damage by this class of herbicides are distinctive. Leaves of tomatoes will be cupped, and the new growth on the plants will be twisted. The tomato plants look spindly and produce few fruit. Poles beans will stay short with thickened leaves that cup up or down. Squash are less affected, and will grow and even produce some fruit before showing symptoms. Other herbicides may cause vegetables to become similarly distorted or bleached out (like glyphosate) but those are applied on site or nearby, whereas the persistent herbicides are problematic because they are difficult to trace and to avoid. Take six small pots and fill three of them with commercial potting mix, and the other three with a half and half mixture of the compost (or manure or straw) in question and the commercial potting mix. Plant bean seeds or small tomato plants in each pot and water. The first pair of leaves will emerge looking normal, but if there is herbicide in the mixture, the second and third pairs of leaves will begin showing abnormal growth. If all leaves look good, you can use those products without worry. 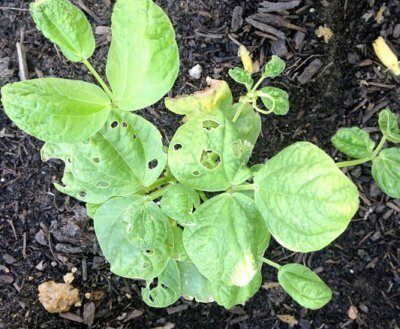 Featured image – Pole bean damage. Photos by Jeana Myers.